Lets start 2013 with something of a round up. A quick reality check, refresh, and splash of Eau de toilette. What we have here then is a brief sampler straight from the Sci-Fi-O-Rama barometer, a long awaited update on a selection of the finest, past featured contemporary artists. 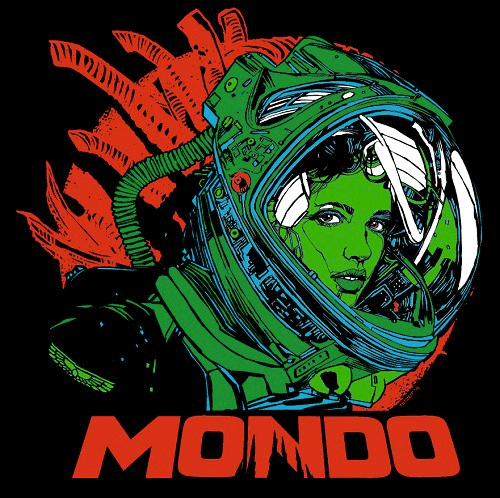 The Mondo Screenprint alas is long since sold out, though I imagine as with other Mondo material they’ll circulate occasionally in eBay (set up a watched search). What I particularly love about this DeLorean DMC-12 rendering, aside from the typical hyper detail is of course the angle, admittedly it’s a while since I last saw the film, but I can’t remember ever seeing a shot of the car at this viewpoint, can you? Just to further extend upon some of the details; chipped and scratched paint, an actual real world design flaw the short lived car manufacturer was infamously haunted by. 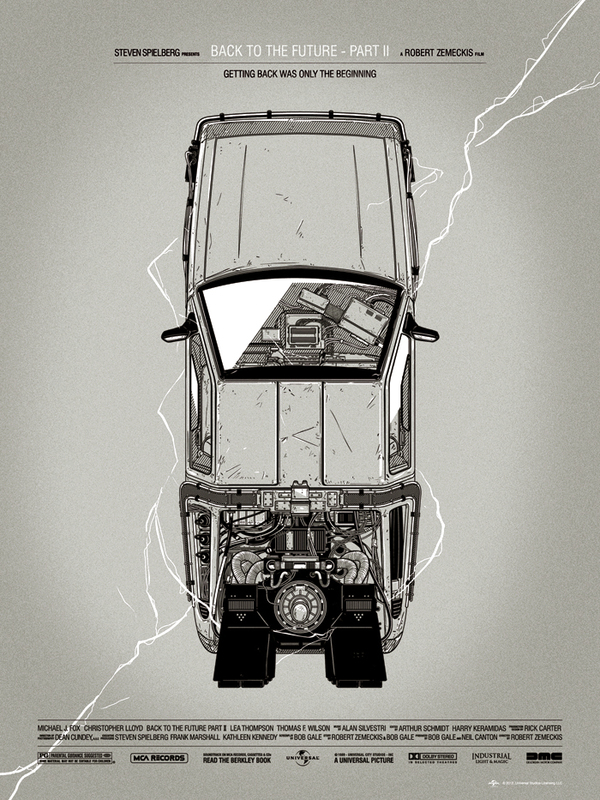 For me though the mastery of the illustration lies within the assorted wiring & tubing that circumnavigates the vehicle slivering inside and out. Designing this mayhem must surely be the most enthralling part, techno illustration with a distinctly psychedelic edge. All of this of course is similar in ethos to the work Japanese cyberpunk maestro Katsuhiro Otomo of whom Gianmarco pays tribute too below. Once again this is another Mondo commissioned limited edition screenprint, a beautiful design that’s very true to the styling of the Otomo originals. For myself as a teenager Akira offered probably the most complete escapist Sci-Fi, but admittedly as 36 year old I’ve paid less attention recently. 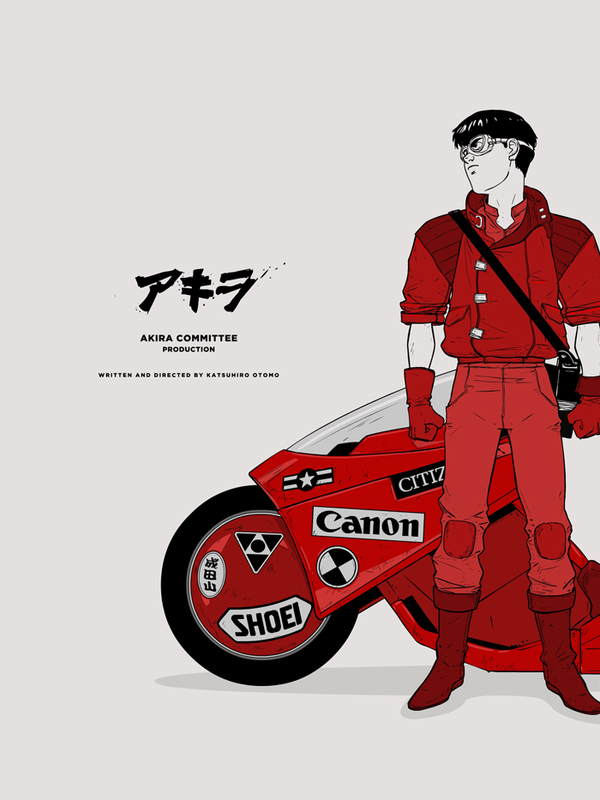 Studying this piece It’s strikes me that I never realised how very 80′s it all is, particularly Kaneda’s jacket with it’s asymmetric fasteners, power shoulder padding and oversized collars. It’s construction presumably would be red leather, though dyed suede and corduroy could work too… anyway I digress! I hope to bring you more from both Gianmarco Magnani and Katsuhiro Otomo this year, in the meantime it’s certainly worth bookmarking and tracking the Silence Television blog. Below we have another classy movie led illustration featuring probably the best helmet ever designed for the silver screen, which appeared of course in quite possibly the greatest sci-fi film ever made. Alien, what more do you need to know? Actually one thing I’m not 100% sure on who the character actually is, the title reads simply ‘Navigator’. Well nothing wrong with a little mystery I guess! 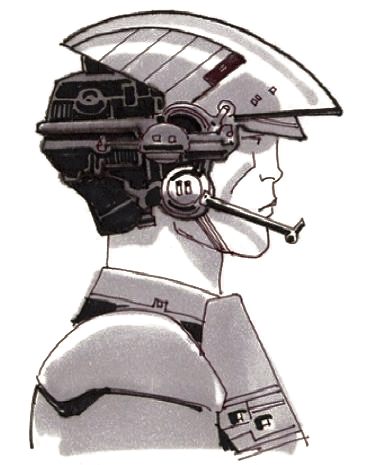 As a quick sidenote it’s nice to see Tyler has included the original Weyland Yutani winged shoulder patch, this of course was orginally designed by John Mollo whom I profiled mid 2011 (Oscar winning Starwars costume designer). If you’ve not had a look you can check that post out here. For more information on Tyler Stout visit his site & shop here at www.tstout.com, or see a selection of his work featured as part of the Sci-Fi-O-Rama special feature on Mondo. Staying with the Mondo connection we move on towards Martin Ansin an artist I’ve somehow managed to not include on Sci-Fi-O-Rama before (ok, admittedly I’ve been slack of late). 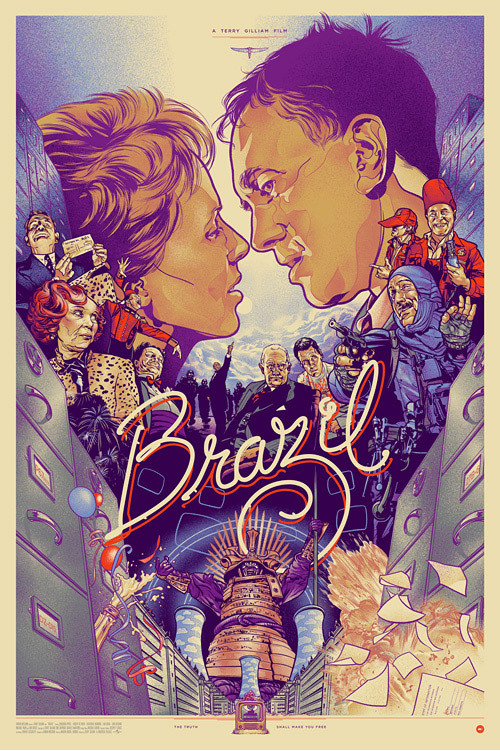 Here the subject matter for this limited edition screenprint is Terry Gilliam’s ‘Brazil‘, the classic dystopian satire that was released in cinemas back in 1985. With regards to the print, lets start by saying it doesn’t get much better than this; composition, mood, colouring and of course the rendering itself are all as close to perfection as one might dare to quantify. Love the diffused texturing, really helps to bring the whole thing to life. I’ve included the poster and two close ups of the detail. Wow! 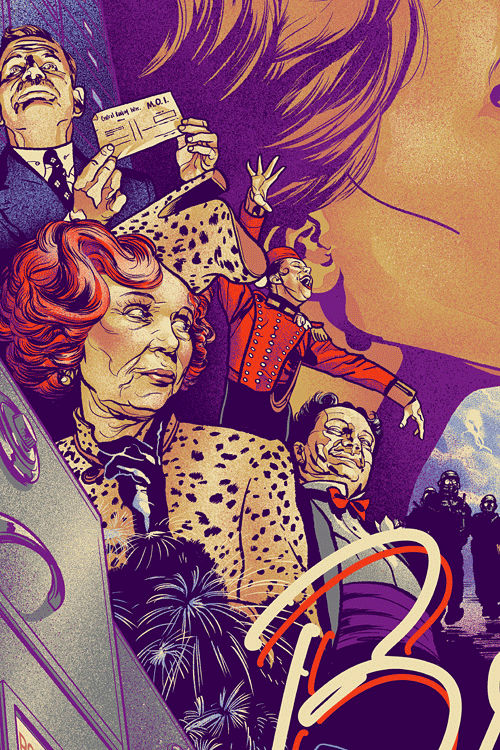 So just art from a single ‘super sample’ here, Martin is definitely someone I wish to profile properly, in the meantime though you can marvel at more from his gloriously rich and expansive portfolio via martinansin.com - utterly, utterly enviable! Moving out beyond Mondo territory we home in upon Jasper Goodall another personal favourite of mine, and of whom I featured back in 2011 (you can read that here). I’ve chosen a couple of fairly recent images via his site. 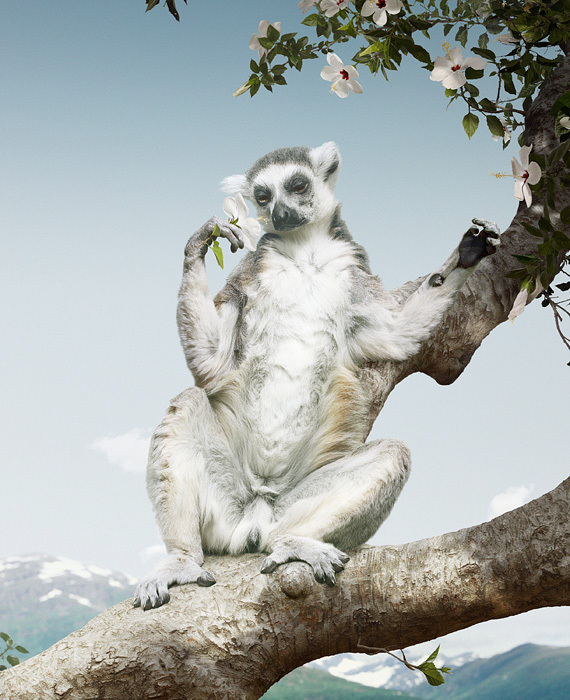 Note that upo visiting the home page is in fact a blog reel so do be sure to scroll down and view the perfect balance between lavish commercial illustration and personal projects. I’ve pulled out a couple of examples of which I’ll annotate below. Here we have an image that totally encapsulates the essence of what Jasper does best - sublime beauty with a gleefully sinister edge – a totally mesmorising style. 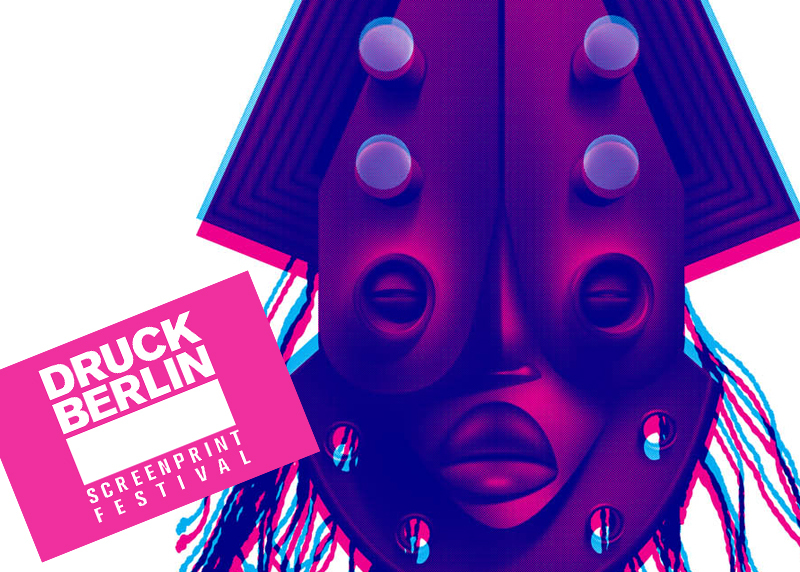 This offset 2 colour piece, was produced as part of the 2011 ‘Druck Berlin‘ screenprinting festival. Following on heres a a Vimeo short (above) that pushes the tribalist face masks further, Jasper notes this video is a ‘bit of a new direction’. It’s a supremely atmospheric piece with subtle but very effective animation, perfectly synchronised with an eerily atmospheric score. 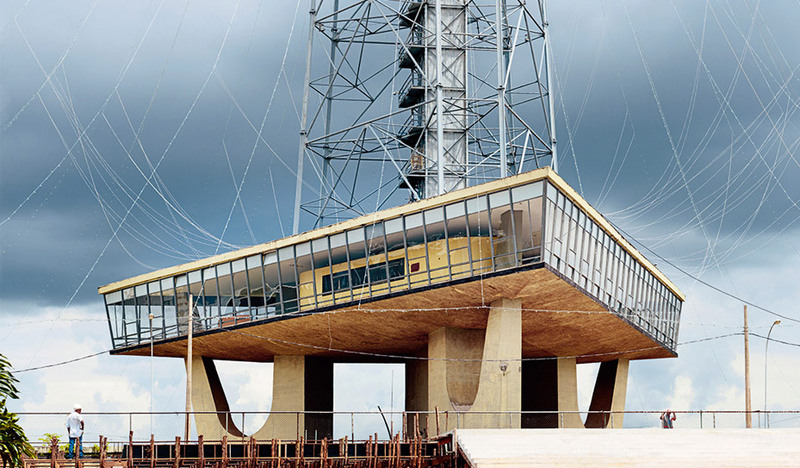 As I footnote I must say it is always a pleasure to check out Jasper’s site, there really is something effortlessly cool that exudes from his work. What would be nice is to somehow absorb the genius via the osmosis of viewing, hasn’t quite worked for me yet! 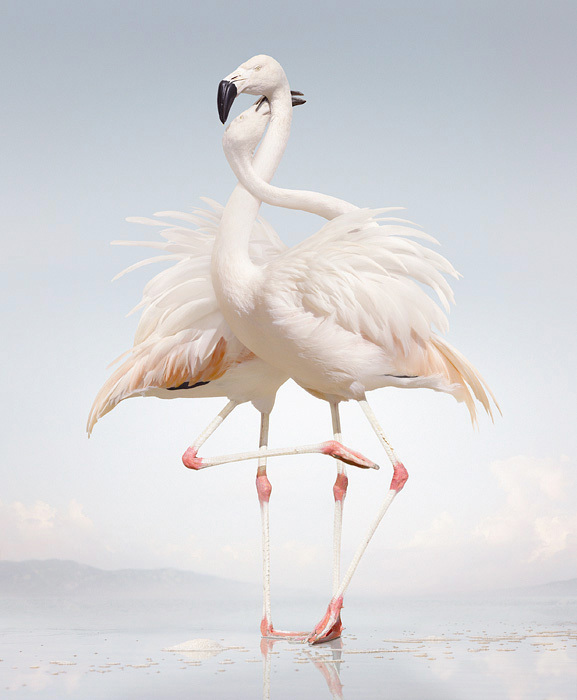 Next up we have a return to the work of Norwegian born artist Simen Johan whom I first featured back in 2009. Though his site has an extensive bio it hasn’t been updated past 2011 so I’m not 100% sure what Simen is working on at the moment, presumably still exhibiting. Definitely an artist I’d like to focus on again this year so watch this space for a more in depth profile. In the meantime here’s a little more from the breathtakingly beautiful “Until The Kingdom Comes”. Underpinned by unrivalled technical prowess Simen’s work resonates with layer upon layer of mystique and otherworldly magic. If wish to see further enchanting samples from ‘Until The Kingdom Comes’ visit www.simenjohan.com. 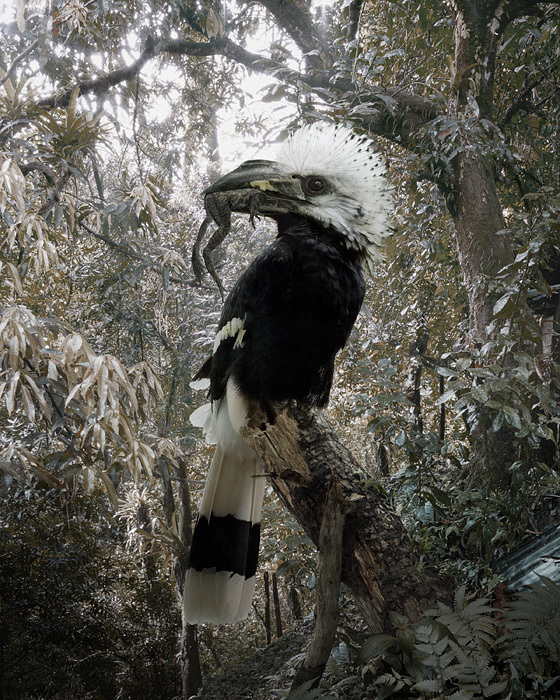 Finally we follow up with another photographic based artist you may well be familiar with, Vincent Fourier. whose imagery constantly circles pops up the major design sites. Suffice to say Fourier has an extremely interesting and diverse portfolio that I thoroughly recommend perusing. I’ll skim the surface and pull out a few examples to give you the lead in. 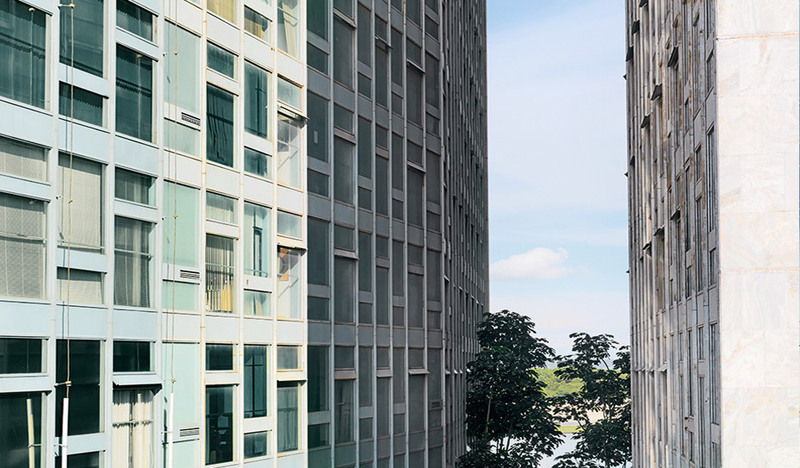 Two brilliantly composed, almost painterly photographs taken from Vincents 2012 project ‘Brasilia’, a study of one of the world’s most modern cities, certainly in terms of utopian 20th century thinking. Brasilia, the federal capital of Brazil since 1960 was conceived and developed in the mid 1950′s, it’s a masterpiece of large scale urban planning and development, and a glittering reflection of the modernist themes of the day. Viewed from above the Brasilia appears as a plane or butterfly, and at it’s visionary helm were a group of three that included urban planner Lúcio Costa, landscape designer Roberto Burle Marx and Oscar Niemeyer as the principal architect. A a quick side note; all three of these men were extremely long lived, and in fact Niemeyer who is considered as one of the fathers of modern architecture lived to an astonishing 104 years of age, only passing away on December 5th 2012. ’O belo Brasil!’ The key to a life longevity? 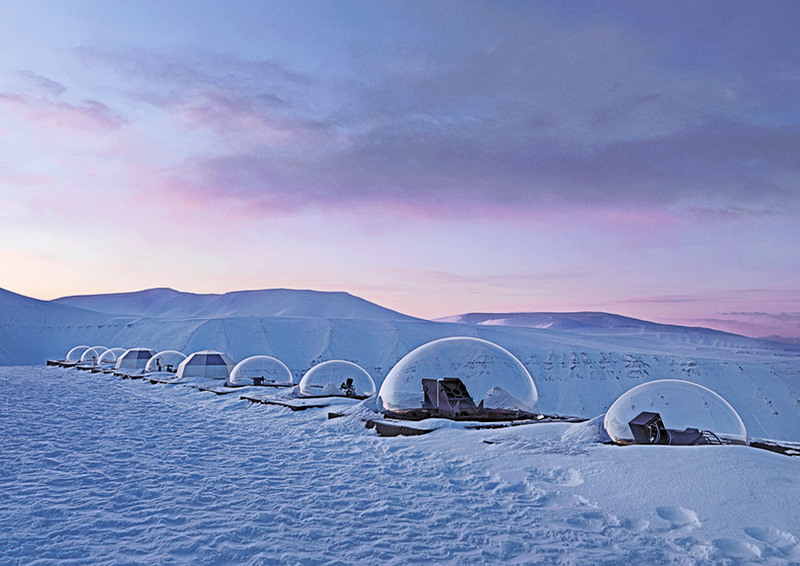 From the steamy sub tropical savanna of Brasilia we warp to the icy wastes of Spitsbergen, a vast and empty archipelago that lies deep inside the Arctic Circle. This another sample from Vincent’s extensive ‘Space Project’ series. We bookend this post with an image taken from Vincent’s ongoing ‘The Man Macine’ series. 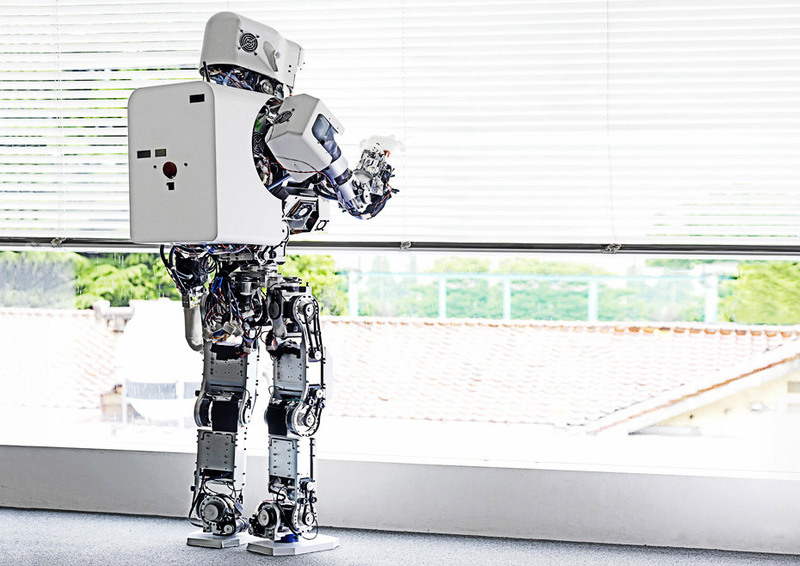 A fly-on-the-wall, impartial study of mankind’s nascent flirtation with robotics and automatons, It’s both fascinating and strangely moving. So that’s that, there and back again. A somewhat disjointed post, or at best a rambling stream of consciousness, still, I hope there’s something you’ve enjoyed. More posts to follow soon. 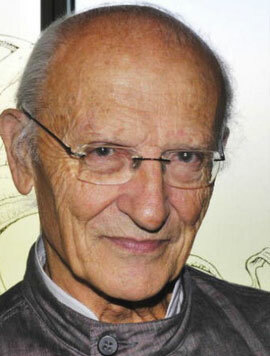 This is a belated tribute post to the late, great Jean Giraud, better known as Moebius and whom sadly, as I’m sure you know has recently passed away, following an extended battle with cancer. A gloomy time for the highest echelon of visual futurists, following the recent death of Starwars designer and visionary Ralph McQuarrie, another brilliant blinding light flickers and fades. For this post then I’ve handpicked a just a small selection of his beautiful art, as usual I’ve then tried to lace with as many leads out as I can for your further reading, lets start with his background. Jean Giruad was born in in the Paris suburb of Nogent sur Marne on May 8th 1938. His parents divorced while he was young and Giraud was sent to live with his grandparents in the country, this rupture he later explained lay at the heart of his choice of separate pen names. With had little formal artistic training other than two years at the École des Arts Appliqués which joined at 16, Giruad was already publishing his cowboy cartoons by his late teens. Upon leaving education he would then spend some time in Mexico with his mother before a stint of national service in Algeria where he collaborated on the army magazine 5/5 Forces Françaises. 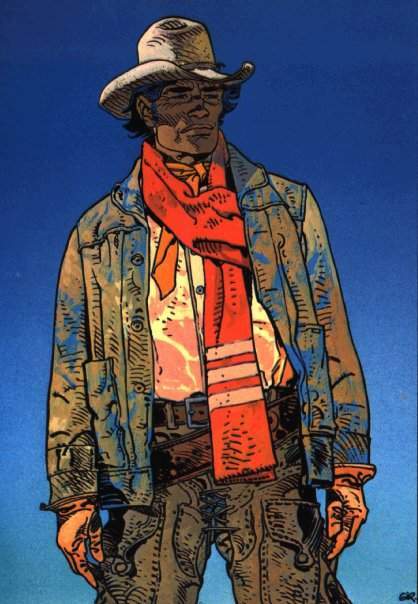 Giraud’s career was set inmotion when he started to work as an apprentice with Belgian Comic artist Joseph “Jijé” Gillain, one of the leading comic artists in Europe at the time. During this period Moebius worked on titles such as Jerry Spring ”The Road to Coronado” of which he inked. Things really began to take off after a collaboration with writer Jean-Michel Charlier and the start of the western comic serial Blueberry, for Pilote and the title quickly gathered a large following. Giraud evolved with Blueberry creating a darker and grittier style, which continued further in 1968 when the loosening of censorship laws allowed more adult themes and explicit content to be incorporated. Above: Blueberry, superbly lit and coloured. in 1975 Moebius joined forces with with journalist/writer Jean-Pierre Dionnet, artist Philippe Druillet, and finacial director Bernard Farkas. The grouped called themselves “Les Humanoides Associes” and together they started the genre busting magazine magazine Métal Hurlant, better known to the english speaking world of course as Heavy Metal. 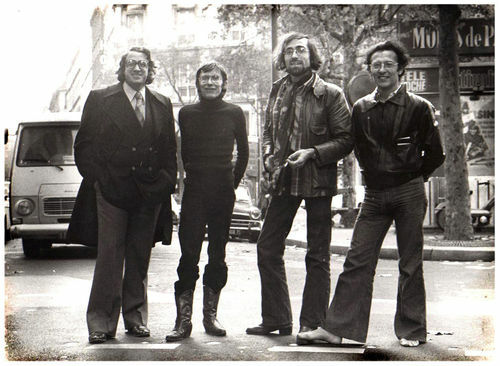 Above: Les Humanoides Associes, barefooted flare-wearer Moebius is on the right, Philippe Druillet next in then Dionnet with Farkas on the left. 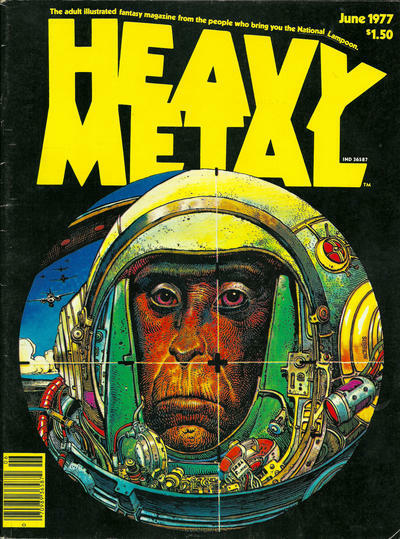 Above: Moebius cover for a 1977 edition of Heavy Metal, trademark with typical hyper-detail. 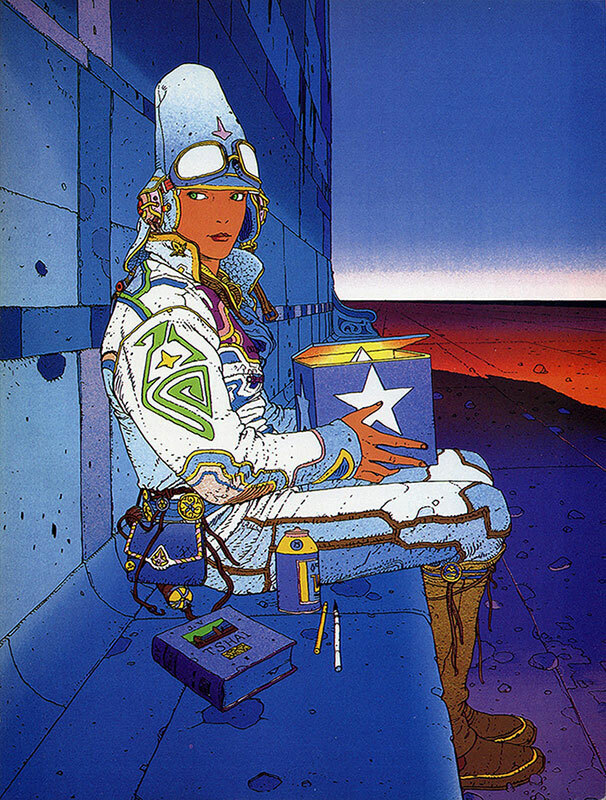 Under the banner of Heavy Metal, Moebius published some of his best loved and acclaimed work, and moved to a greater international stage. Material from this period includes the groundbreaking Azarch, named after it’s silent warrior protagonist who rides a pterodactyl-like creature through a strange, desolate landscape. 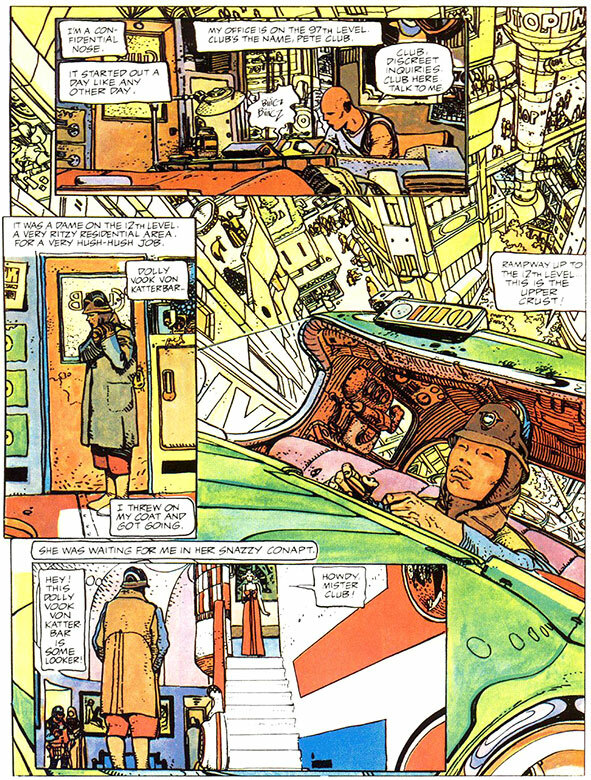 Giraud also penned the the non linear, Airtight Garage strip, which he basically made up as he went along! The ‘Garage’ in question was in fact an asteroid that housed a micro universe. Below: A page from The Long Tomorrow, imagine the impact power this had back in 1976. 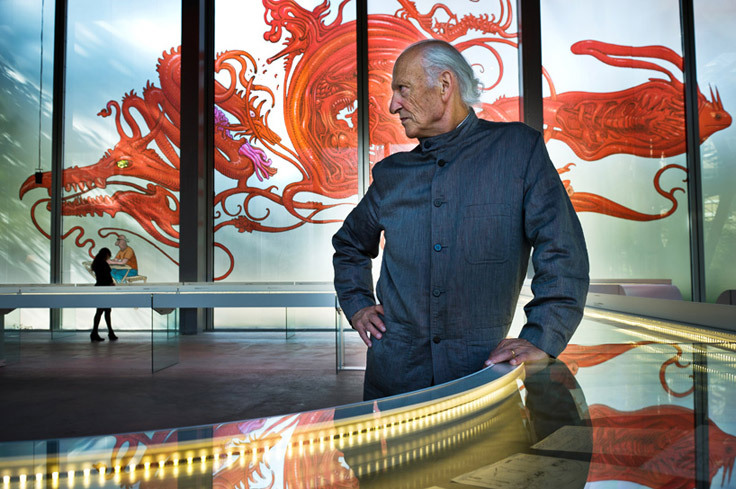 In addition to comic art and illustration Moebius of course has a long CV of working with film and animation, this all started back in 1974 when was asked by Alejandro Jodorowsky to contribute art to his doomed, big screen adaptation of Frank Herbert’s “Dune”. If you’ve never heard of this unbelievably ambitious project, then you in for a real treat, I’ve posted about it in the past, but your best to head straight to the source: http://www.duneinfo.com/unseen/ also attached were Chris Foss, HR Giger, Pink Floyd for the Soundtrack with Salvador Dali to play The Emporer for a rumoured $100,000 a day! 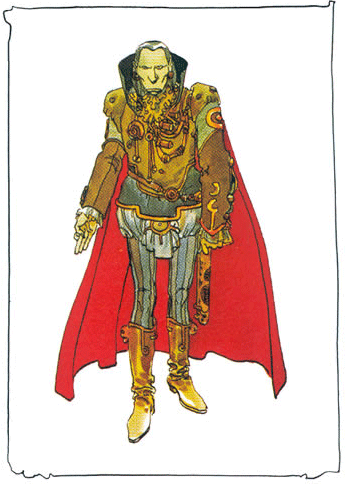 Above: This regal character from Dune is Doctor Wellington Yueh, wonderfully ornate detailing. 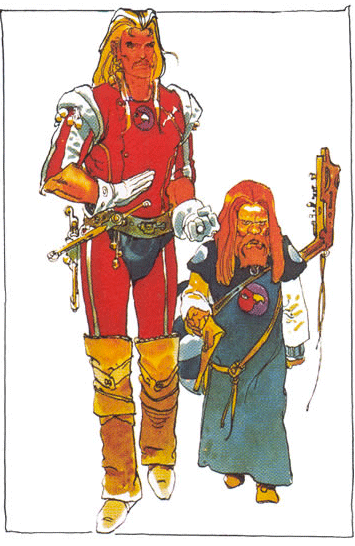 Above: More concept costume artwork from the unseen Dune, Duncan Idaho (left) and Gurney Halleck (right), excellent boots and erm codpiece. 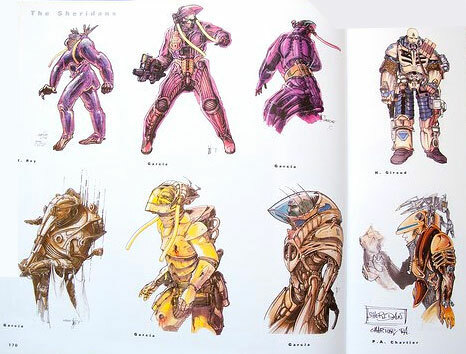 One thing I really love that features again and again in Moebius’s art is the graphic detailing, the bird graphic on these characters chest’s is a great example, in fact I’ll make a point to research and write about the graphical lexicon of Moebius in future, masterful work. 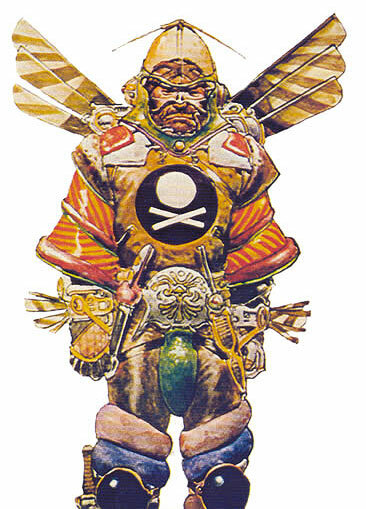 Below: A Spice Smuggler, Moebius at his most playfully wild and outlandish – just superb – but again I think minimal skull and crossbones graphics caps the hole outfit off. 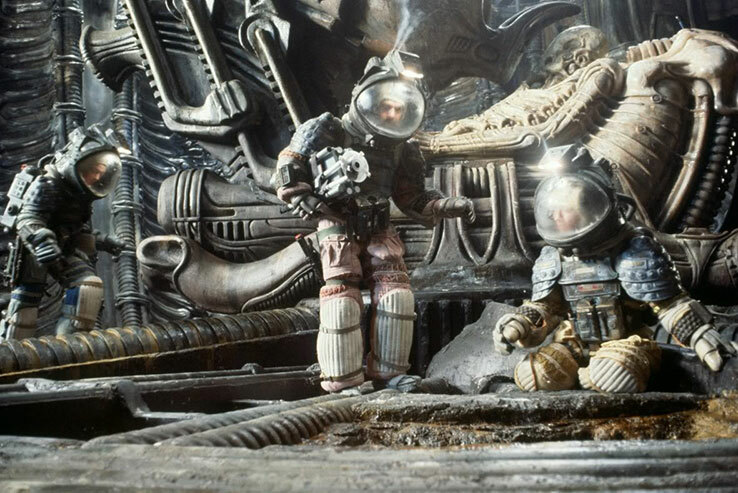 The next big film project to come along was Ridley Scott’s 1979 Sci-Fi Horror classic Alien, joining part of a creative force which again included Giger and Foss. 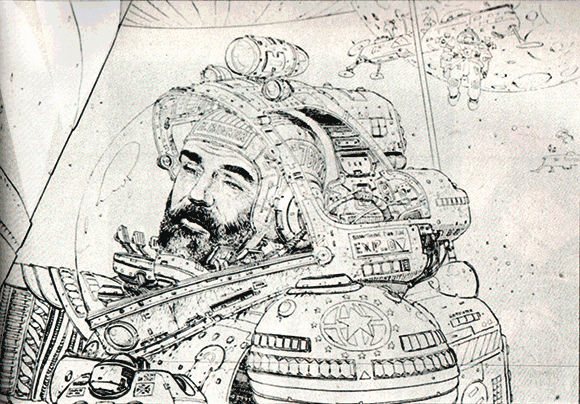 Moebius’s creative involvement however was cut short after a difference of opinion with Scott, limiting his involvement to just three days. 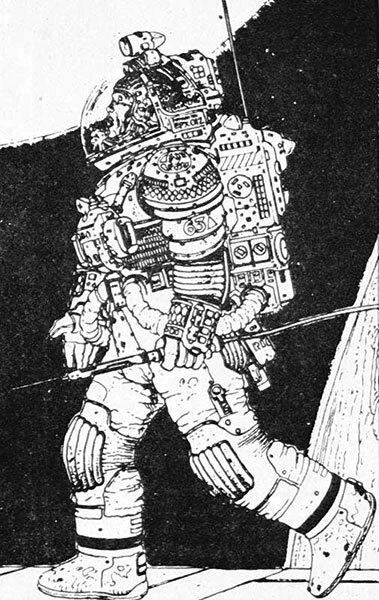 This was still sufficient time to make an impact, as his conceptual spacesuit drawings made it into production with only minor changes, as you can see below. 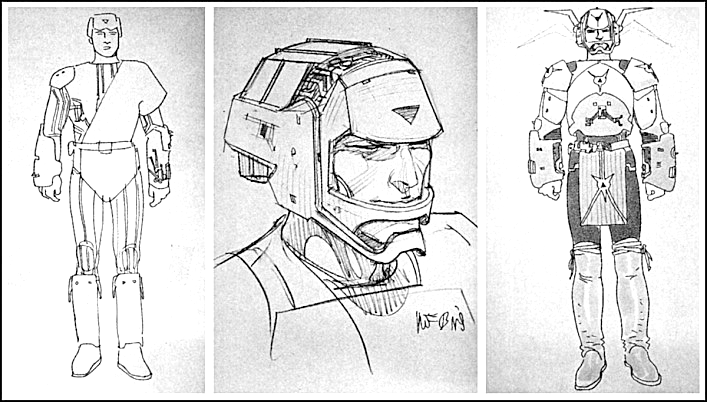 Above: Original Sketches for the crew’s EVA suits, which are I must say probably one of my favourite movie costumes. 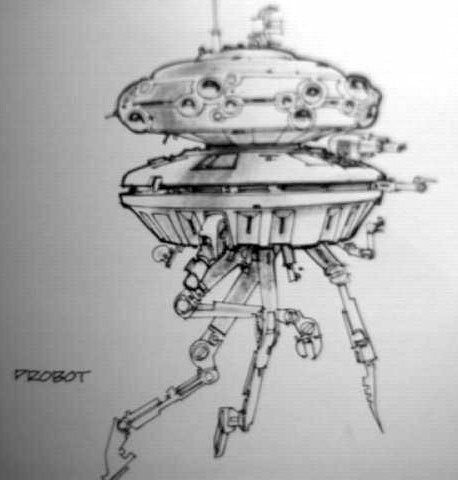 Next up something we have a conceptual drawing of an Imperial Probe Droid, that appears memorably at the beginning of The Empire Strikes Back. I had absolutely no idea Moebius was involved with the film until researching for this post, I always thought the droid design and its garbled transmission pattern was one of the coolest things in that movie, and now I know why! 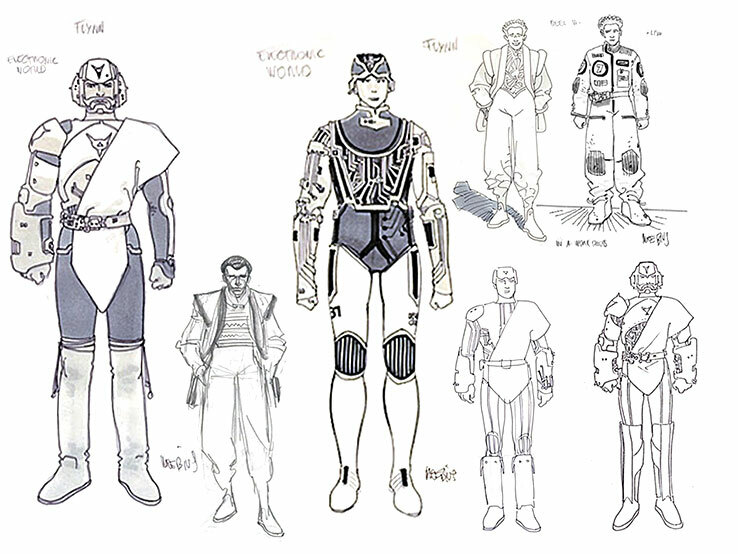 Work on the revolutionary CGI pioneering film Tron (Disney 1982) would follow next, with Moebius once again acting as a conceptual artist and back up storyboard creator. Heres a small selection of the art, fascinating when you consider just how close some of these drawings are to the actual finished costumes. See more of the artwork over at http://theairtightgarage.tumblr.com/search/tron a wonderful Tumblr blog dedicated solely to exploring the work of Jean Giraud. Another film I’ve covered in the past and also from 1982 Moebius is the Franco-Hungarian animated film “Les Maîtres du temps” (Time Masters) directed by none other than René Laloux. 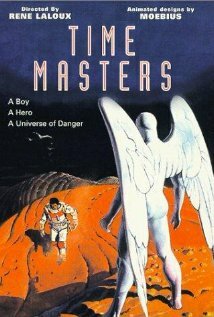 Moebius was employed as designer and judging by the box art obviously having him involved was a big deal, as his name takes prominence on the box art, top right of the image below. For more imagery from Les Maîtres du temps check out Eric Carl’s excellent gallery set over at Flickr. 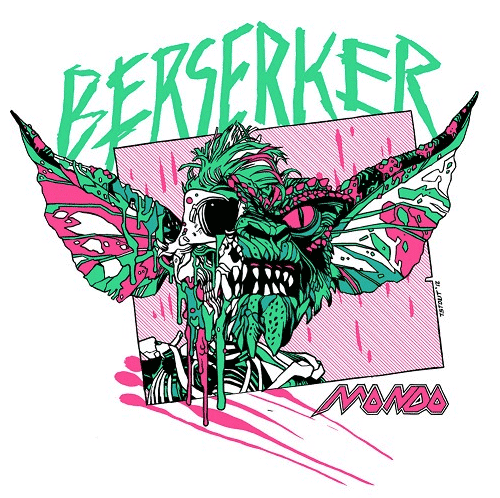 Throughout the 80′s Moebius would continue to be involved in major hollywood projects including Masters of the Universe (1987) Willow (1988) and The Abyss (1989) though ultimately neither Lucas or Cameron would use his designs. Probably the film that owes most to art of Moebius is Luc Besson’s The Fifth Element (1997), the project started out in 1991 as a script titled Zaltam Bleros, and Giraud was hired in the early stages to produce concepts for costumes, vehicles and sets. Over the next 6 years Zaltam Bleros would under go many revisions before emerging as the popular super camp blockbusting space opera though throughout it’s metamorphosis Moebius’s designs essentially remained intact. The relationship with Besson would turn sour as after the films release Moebius and Jodorowsky attempted to sue accusing him of blatantly plagiarising The Incal, a comic book series they had started in 1981. The case was unsuccessful though and in fact Jodorowsky would later conceed he actually considered it an honour that somebody stole his ideas. Above: Art from Luc Besson: The Story of the Fifth Element currently retailing new on Amazon for nearly $900 ! 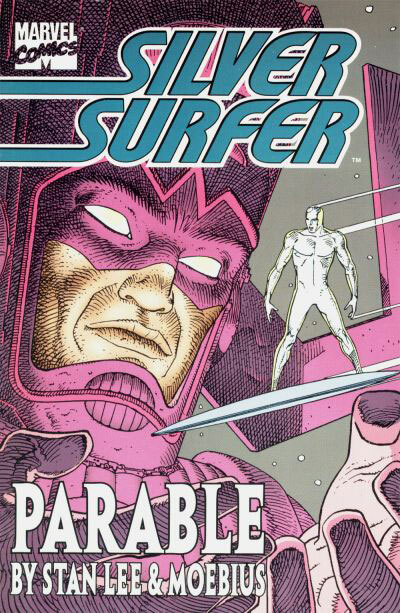 Of course whilst all these film projects were ongoing so was the comic illustration and writing, including collaboration with Stan Lee and Marvel comics on The Silver Surfer as you can see below. Specific comic series is something I shall cover in depth in future posts. To underline the importance and prominence of Moebius in his native france in 1988 he was chosen among with 11 other winners of the prestigious Grand Prix of the Angoulême Festival, to illustrate a postage stamp set issued on the theme of communication. In recent years Moebius’s work has been the subject of several exhibitions, sharing a joint exhibition 2004/2005 with Hayao Miyazaki at La Monnaie Paris, and then in 2010 his very own grandoise ‘Moebius: Transe-Forme at Fondation Cartier’ once again in Paris. This was something I posted about at the time, If you’ve not seen the imagery before it’s definitely worth a look, stunning stuff, I really wish I could have gone, oh yeah and I love Giruad’s sharp tailor suit. So that draws my brief tribute to a close, there’s so much more I could write and post about, and of course I shall continue to do so in the future, a future in which without doubt Moebius’s legacy will just continue to gracefully evolve. Jean Giruad – Moebius passed away aged 73 and is survived by his second wife and business partner, Isabelle Giraud and two children Helene and Julien from his first marriage. io9.com tribute post with Willow and Abyss artwork. Not sure how long this link will remain valid, but while it’s up do check the Moebius Redux documentary, originally broadcast on BBC4 a couple of years ago. Against all odds, Lucas armed with McQuarrie’s wonderful paintings finally managed to twist 20 Century Fox’s arm into comissioning the project, filming in Tunisia would start shortly afterwards. McQuarrie carried on with the Trilogy, working on both sequels, examples of which I’ve included here. Interestingly (I didn’t know this) Ralph also has a uncredited, non speaking part in The Empire Strikes Back, you can see that here kinda funny as he walks across screen in front of one of his own matte paintings. Though obviously most famous for his work on the Starwars universe, McQuarrie’s highly impressive reseme includes Raiders of the Lost Ark, ET, Battlestar Galactica, Close Encounters of The Third Kind and Cocoon, which earned him an Acadamy Award for visual effects in 1986. 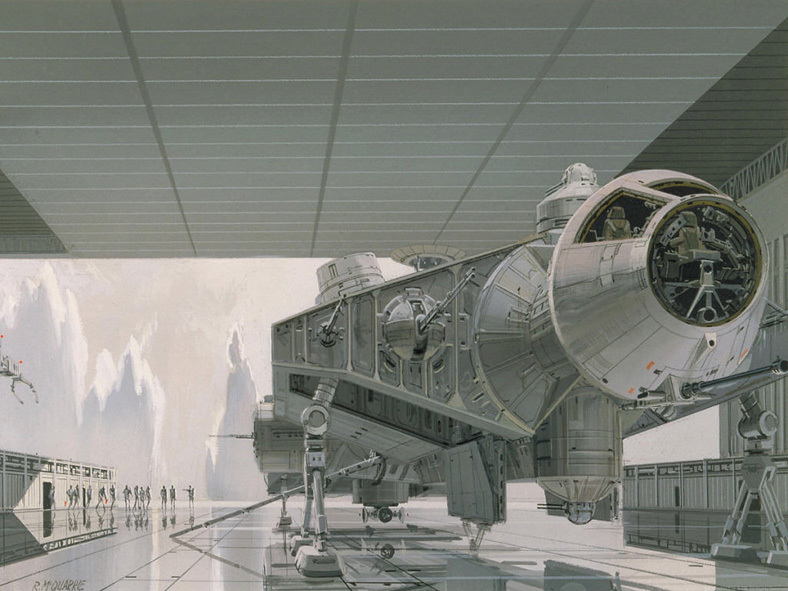 Above and at the head of post are a few of my favourite McQuarrie images, I love the way his imaginings are slightly more streamlined and delicate than the intricate models they became, wonderful stuff! Here are a few links for futher reading, firstly some great interviews (dating back to 1978) at http://www.ralphmcquarrie.com/interviews/index.html also at his site check through the portfolio sections, I’ll strive to track down some of McQuarrie’s lesser known work for future posting. 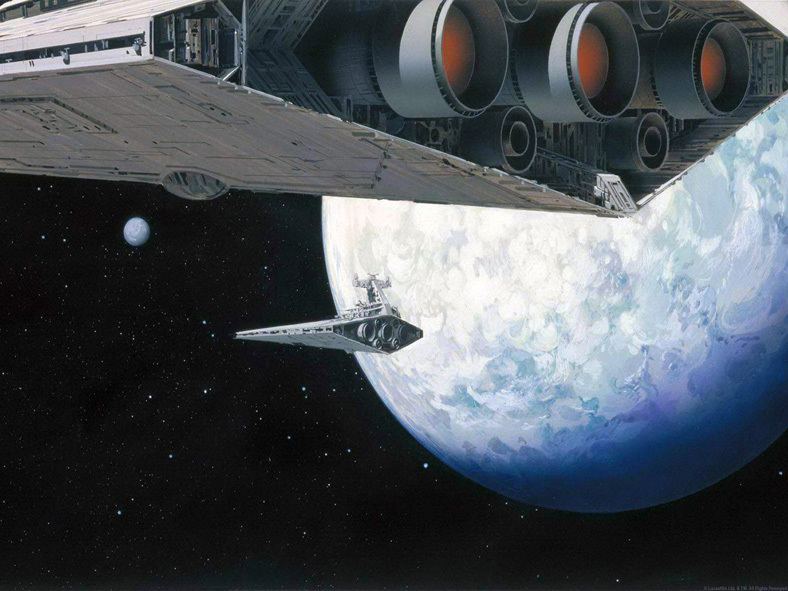 Also check the Day of the Jedi, for broad collection of Starwars concept art.